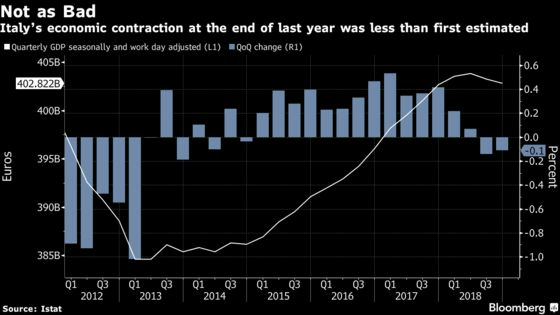 (Bloomberg) -- Less than three months after a spat with the European Union, Italy’s fiscal plans are back in focus as the pressure on Rome to tackle the country’s stalled growth mounts. Finance Minister Giovanni Tria is working on a new plan of incentives that would allow the country to avoid a budget adjustment, according to newspaper Corriere della Sera. Last Friday, Tria presented to Prime Minister Giuseppe Conte a strategy that rather than cutting resources would slightly boost spending with new funds to encourage companies’ investments, the newspaper reported, citing anonymous Treasury sources. Italy was the only nation in the euro region slipping into a technical recession during the last quarter of last year, when the economy shrank 0.1 percent, casting doubts on the populist government’s growth target for this year. Some economists forecast growth of 0.1 percent this quarter, but many say there’s a high risk of another contraction. According to Corriere della Sera, the new plan could be approved as early as April, and would also include new investments for small municipalities and tax benefits for companies that are hiring. Meanwhile, new tax rate cuts and efforts to introduce a so-called “flat tax” could be part of Matteo Salvini’s League campaign for a crucial European Union election in May, according to La Stampa. Ansa reported Sunday that the cost of a flat tax for households could add up to 59.3 billion euros. “We have not stopped working on flat tax,” Salvini said in remarks quoted by Ansa Sunday.